Thousands people of local and foreigners jammed the main road of Peliatan village- Ubud, on Tuesday November 2nd. 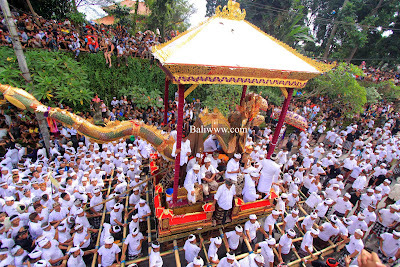 They paid their last respect to the late King of Peliatan, Ida Dewa Agung Peliatan who passed away on August 2010. Many locals were involved to make this biggest royal cremation going smoothly. Meanwhile the foreigners seem don’t want to miss this royal procession by capturing this grandeur they never see before using camera, on the side of the road. Police officers and traditional security officers named Pecalang tried to prevent the force of people who would like to watch the grand procession from the closer area. They then made a posse so that the series of ceremony was not bothered by thousands of people. The same thing was also done by these officers on the previous days when the royal family brought Naga Banda (dragon effigy) from Ubud Palace to Peliatan Palace. On that day, the royal family chartered two elephants to transfer the Peliatan King’s successor, Cokorda Putra Nindia.